Cardo partnered with JBL to deliver the best sound quality the market has ever heard. The JBL speakers included with the PackTalk Slim measure 40mm across for a full-range immersive listening experience. You'll hear balanced bass and crisp treble like never before. Speak and Pack Talk BOLD listens. Menu navigation experienced with everyday riding is handled through Cardo's Natural Voice Operation system. "Hey Cardo, music on", "Hey Cardo, next track", "Hey Cardo, mute audio"; keep your hands on your bars where they belong with Pack Talk BOLD. This is the headset communicator to get if you are, as the name suggests, riding in a large pack. It isn't fair to just call it a Bluetooth communicator though. 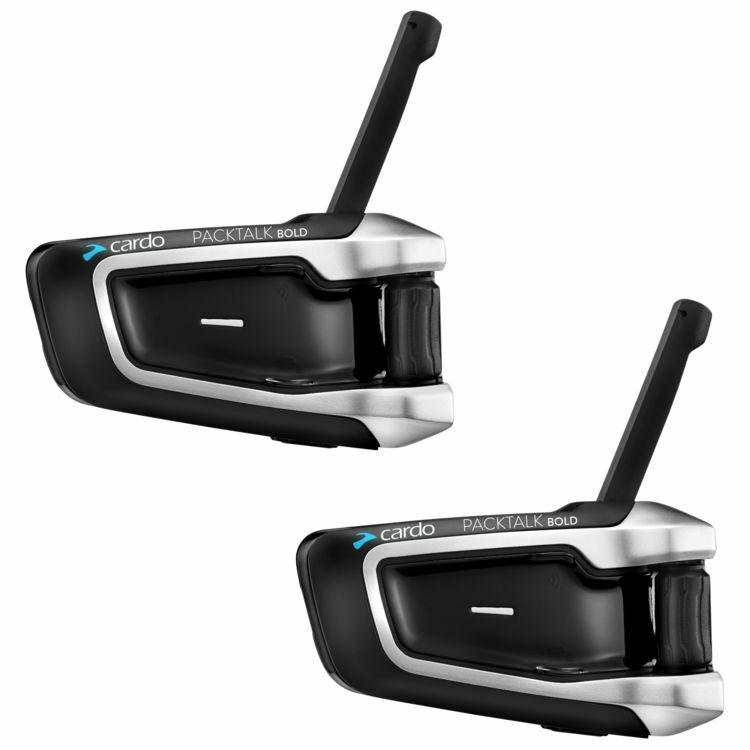 The Pack Talk uses Bluetooth in conjunction with Cardo's own proprietary wireless platform, the Dynamic Meshwork Communication, to deliver exceptional clarity and a staggering line of sight range: up to 1 mile unit-to-unit and up to 5 miles when maintaining less than 1 mile between riders. Setup is a breeze thanks to an Android/iOS compatible App. The Cardo Smartset App allows you to configure riding partners and set preferences using an intuitive step-by-step menu on your phone in front of you instead of listening to prompts and futzing with buttons on the device itself. With intuitive menu operations and the ability to easily sync up with friends the PackTalk is the ideal device for riding stag or rolling deep. The roller bar that controls the volume came off on mine during our first long ride! Not sure how it happened, but we were far from home and I could barely hear my husband talking. I had purchased the pair online from CycleGear and had the Draper, UT store install them @ no charge; however, hadn't paid the extra $30 for the insurance coverage. The smart and helpful gal at the Tucson CycleGear called a fellow at the Mesa store (they didn't have them in stock in Tucson). When we arrived at the Tucson store the next day, Lucas fixed us up right away by calling the manufacturer; (I was able to use my cellphone to prove the date of purchase--less than 30 days) and sold me the 2 year $30 coverage that will protect us in the event of future problems. Worst case scenario would have been to go without communication for 500 miles, return home and mail them to Cardo and wait for a replacement. Thanks, CycleGear! Still learning how to use it. I find it difficult to manipulate it with my gloved left hand (have some neuro issues). You can pop them out to charge them, but we usually just keep them on the helmets. I finally was able to say "Hey Cardo volume up" and it worked -- but not until after we got the new unit. Could be user error, but it ignored me until we replaced it. Oh, and a heads-up: your unit will work for 2-3 hours once you get it installed, but remember to charge it before that long ride! can I talk with my passenger ? Can I talk to difrent brand units? BEST ANSWER: I have connected with 2 other Sena devices at the same time before. The Senas have to be put into bluetooth phone pairing mode to work. Took a while to figure out but it is do-able. Their are also YouTube videos showing stel by step how to pair a sena and a cardo. Can't use the mesh network though, so limited to 4 devices. will this unit pair with a g4 and a g9?